Amazing Grace Crochet Charity Drive… Week 3 Featured Pattern!! Pay it forward and donate your crochet items to the Amazing Grace Crochet Charity Drive!! We are starting week 3 of our Amazing Grace Crochet Charity Drive and what a perfect time it is to start crocheting and donating!!! Once the weather begins to cool off and the kids are back in school, Crochet becomes a standard in many homes!!! 1. Make and mail in your Handmade Crochet Items between now and October 31st. 2. Each item collected during the designated time-frame will be eligible and receive an entry for the prize package. 3. Items must be mailed into Beatrice Ryan Designs by the designated date to be eligible for prize package. 4. All items received will be photographed and mailed in a bulk package to Crochet For Cancer for their charity and distribution. 5. Follow the specific guidelines for making items you are donated for the safety and comfort of the recipients. This is the Fun Prize Package you could win!!! The goal is to donate 250+ items !! So please get your hooks and yarn out and have some fun paying it forward! 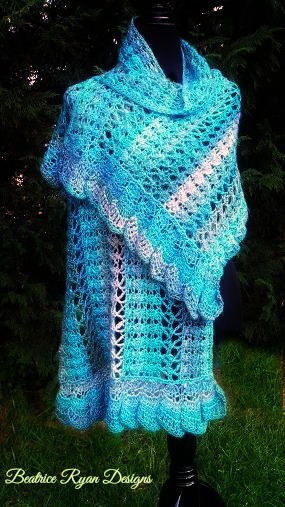 The Amazing Grace Prayer Shawl… This is the 3rd pattern in the Amazing Grace Series and one of the top viewed patterns on my site… Perfect for covering the shoulders of someone who is suffering or recovering from cancer with warmth and prayers! This pattern is near and dear to me… When Sandy was diagnosed with Breast Cancer, I made a Prayer Blanket in this color and a similar pattern. 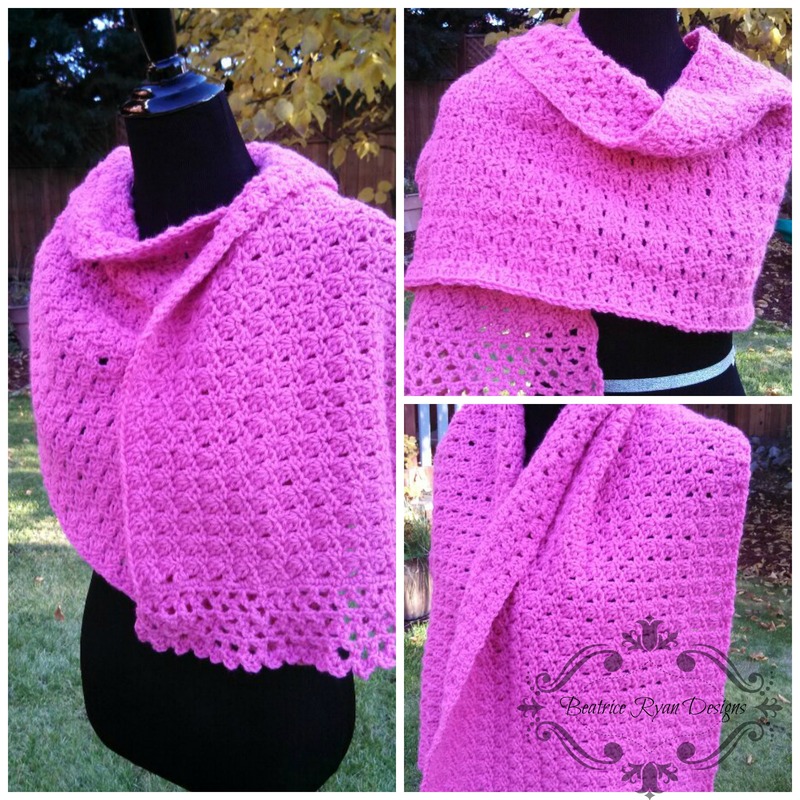 She kept the blanket with her all the time and snuggled in it when she was receiving chemo and having her surgeries… When I decided to write a new pattern, I decided to make this Amazing Grace Prayer Shawl in pink to honor Breast Cancer Awareness!! I hope you will make a few to donate and maybe even one for yourself. There are 10 Amazing Grace Patterns to choose from and more to come very soon!!! Amazing Grace Crochet Charity Extravaganza!!! Today we are kicking off our 9 week Amazing Grace Crochet Charity Drive and Crochet Prize Package Giveaway!! Please join me over the next 9 weeks by paying it forward and making some items to donate using the Free Amazing Grace Patterns and/or any of your favorite patterns. All donations will be donated to a great charity ~ Crochet For Cancer!! 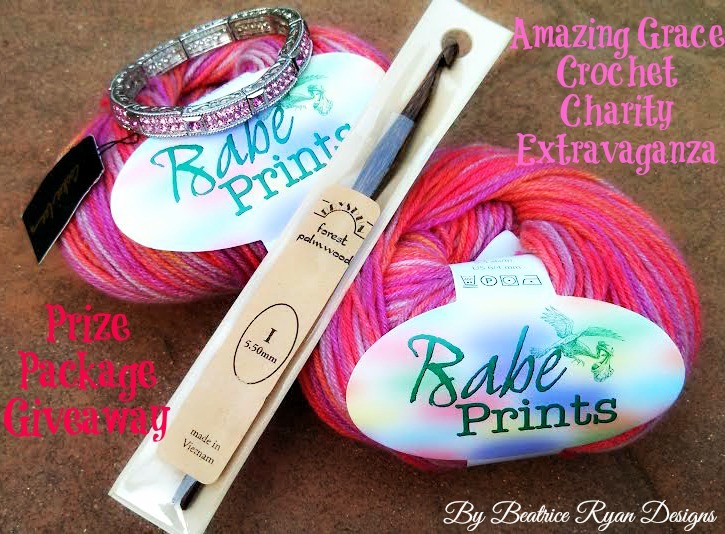 The donations will be collected by Beatrice Ryan Designs and mailed to Crochet for Cancer in early November!! Donation Goal…250 items!!! As many of you know,,, Breast Cancer Awareness is the main driving force behind all of my Amazing Grace Patterns… Our Charity Drive will continue through the end of October, which is Breast Cancer Awareness Month!! For more details on my story you can click on the Amazing Grace Pattern Tab at the top of the page! As a very big thank you … There will be a new Amazing Grace Hat design in September and a very special Amazing Grace Pattern that will be released at the end of the charity drive… You will love this one!!! 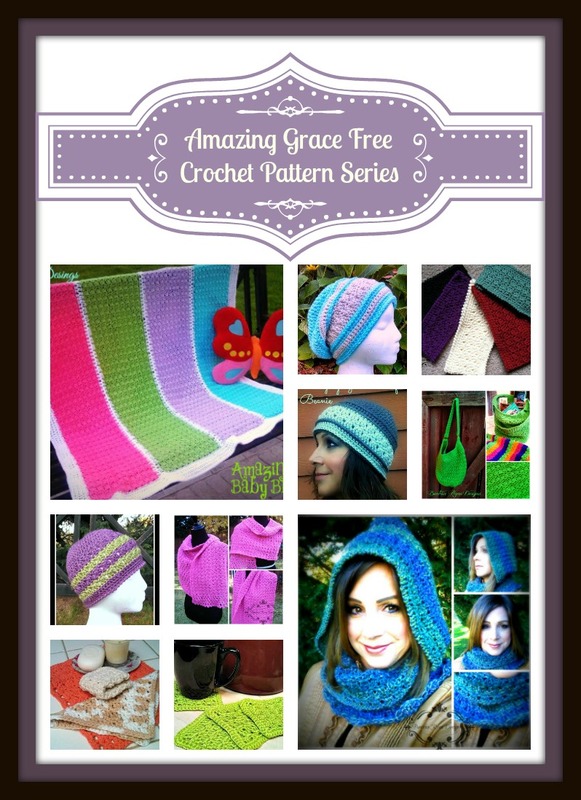 Amazing Grace Free Crochet Patterns…. 1. 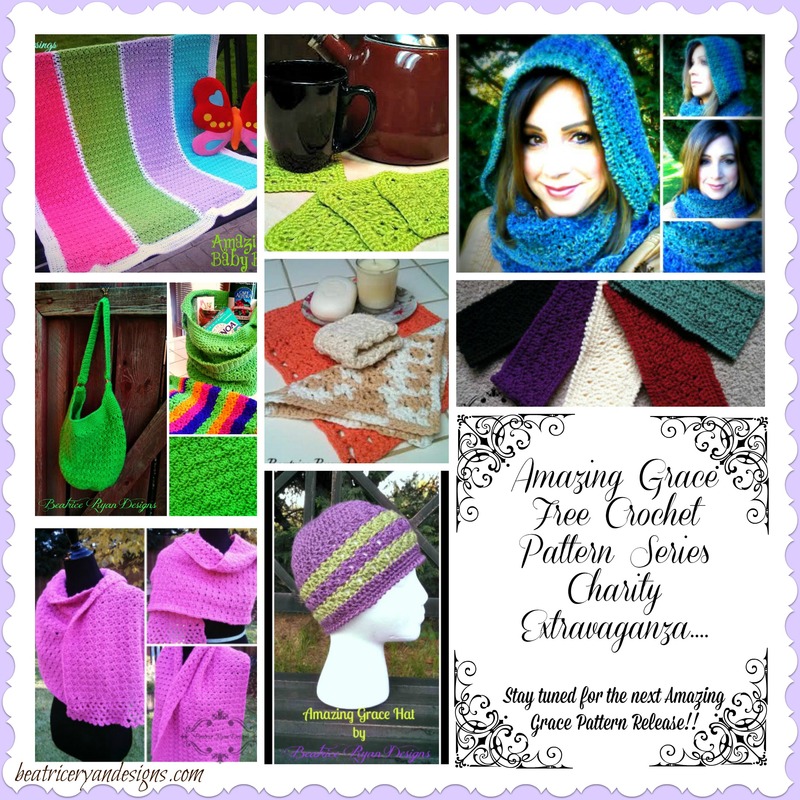 Each week I will feature one of my Free Amazing Grace Patterns. I will share a little about my journey of designing each pattern and encourage you to make any of the Amazing Grace Patterns throughout the 9 weeks! 2. I will be asking you to donate items made from my Amazing Grace Patterns. Other items will be accepted and will also be eligible for the Grand Prize Drawing also! 3. You will mail all of your completed items to me through out this Charity drive. The final date of accepted donations being October 31, 2014 to participate in the giveaway (yes.. there are prizes). My address will be available in the Amazing Grace Crochet Charity Tab at the top of the page. 4. Please make all your items following the guidelines put together by Crochet for Cancer to keep all the items safe and comfortable for the cancer patients and family members who will be receiving them. These guidelines will be available in the Amazing Grace Crochet Charity Tab at the top of the page. 5. All items collected between now and October 31st will be photographed and then mailed to Crochet for Cancer in early November. The lovely staff at Crochet for Cancer will disperse the items to those who are in need. To read more about Crochet for Cancer Click Here! The Grand Prize Package includes: 2 Skeins of Babe Prints Yarn, 180 yards each of a super soft Acrylic/Nylon Blend ~ 1 Beautiful Crochet Hook, Size I hook made from Forrest Palmwood (These hooks are my favorites) ~ 1 Beautiful Pink Crystal and Silvertone Bracelet (In honor of Breast Cancer Awareness). This prize package is solely donated by Beatrice Ryan Designs and has a value of $50. All handmade items made using one of the Amazing Grace Free Patterns or any of your favorite patterns will be eligible for the prize package. The eligible items must be received by the deadline of October 31st, 2014 to be entered into the random drawing on November 5th 2014. Each eligible item received will be given a ticket with a number. On November 5th 2014 a computer generated number randomizer will select the number and the winner of the prize package will be announced here at Beatrice Ryan Designs. Please make sure to include your name and email address in your package! The rules will be posted in the Amazing Grace Crochet Charity Tab at the top of the page along with my address and all the very special instructions for making your donated items. Let’s Get Crocheting and make this a very special event!!! Midnight Breeze Crochet Shawl Video Tutorial!! Today I finally get to spill the beans… My good friend Clare from Bob Wilson 123 has been gracious enough to make one of her famous You Tube video tutorials featuring my Midnight Breeze shawl… This is a full tutorial from start to finish about the pattern and all the instructions!! 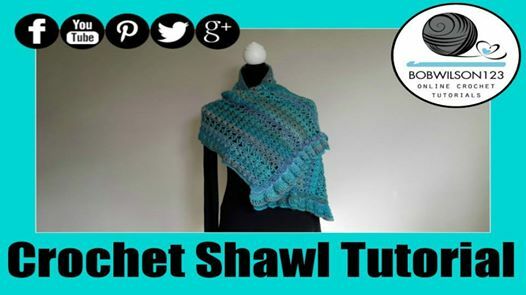 She is whimsical and fun to watch… And has made this pattern tutorial so simple that a beginner can make this shawl.. I hope you will go check out this video and if you haven’t made the Midnight Breeze Shawl… Now would be the perfect time!! Click Here for the Link to the Midnight Breeze Shawl Video Tutorial!! Click here for the written pattern instructions!